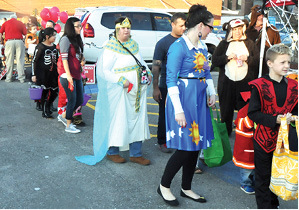 There were spooks, ghosts and goblins of all shapes and sizes who found their way to the 7th Annual Boo Fest in Albany last Tuesday afternoon to celebrate Halloween. 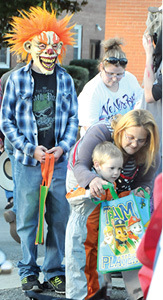 One of the event organizers, Albany City Council member Tonya Thrasher, told the Clinton County News this week that it was estimated that well over 1000 children made it through the more than 30 booths that had been set up to hand out candy for the event, a count that didn’t include the parents and adults who were accompanying the candy and treat seekers. Moved this year to the Foothills Festival Building parking lot to accommodate the growing crowds and increase the level of safety, the line of those trying to make their way to the treats at one point stretched down Cross Street past Campbell-New Funeral Home.